In the spring of 2008, Tina Fischer set out on her road bike to take a leisurely ride and as she was praying, as she often did, she heard a voice say, “tell them about me”, and “tell them that I love them!” Days and weeks went by having not given much thought to that day, but continually that phrase had come to her mind. Finally after much prayer, Tina set forth that summer on a 2 week cycling trip across Northern Ontario sharing her faith and telling others about Jesus Christ. This trip marked the beginning of her cycling ministry which she led each summer thereafter. As her ministry grew larger each year, in 2012 Tina retired early from her 20 year high school teaching career for the local school board. God has prepared her for this special ministry as the “cycling evangelist” using her experience as teacher, musician and avid cyclist. On Nov 2013, Tina embarked on a full time adventure: sharing the Christian message of hope and salvation while touring on her bicycle across North America. 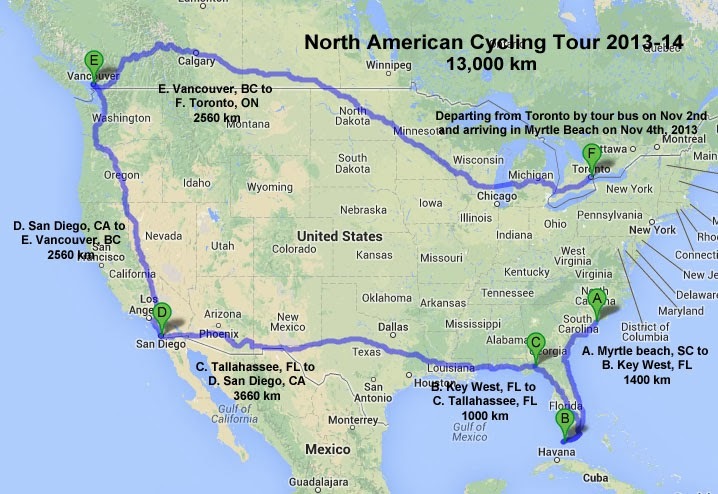 On November 2nd, Tina left for Myrtle Beach, SC to ride a 13,000 km – 8,000 mile missionary tour across North America. Visit the Cycling4jesus blog for frequent ministry updates and exciting testimonies. We will be praying for you as you cover your route. Will you have an icon on the route which will move each day to show us your location? Hi Art. Great idea! I will look into how I can do that on my iPad. Either way I will be posting daily with an update on my location and people I get to minister too. Wow that is quite the trek Tina you are awesome will definitely be praying for you. Love you girl; safe journey and Gods blessing every step of the way! Great to meet you, I heard about you through someone I run with at Running Room! I look forward to reading your blogs! Great news Sean! Praise the Lord! What a blessing for you!